Your ticket to ride — into space, the ultimate travel adventure — may be ready to buy sooner than you think. This journey, using a capsule and a balloon, is available in this year’s Neiman Marcus Christmas Book, priced at $90,000 per person. A product from Arizona-based World View expects to welcome its first passengers by 2017. 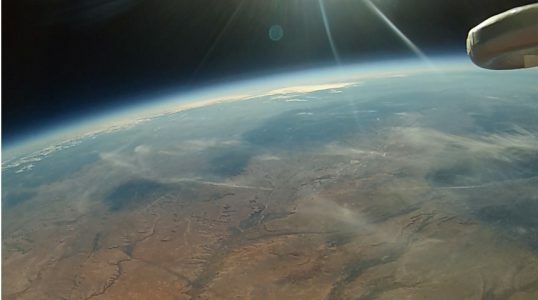 The journey will begin as a high-altitude balloon the size of a football stadium rises above a passenger compartment the size of a small private jet. The capsule ascends about 1,000 feet a minute, taking an hour and a half to rise to 100,000 feet. “Just about then, the sun will be coming up and you’ll see amazing vistas of the rising sun over our planet. We will stay there for a couple of hours watching the amazing view and having the ultimate Facebook status update,” said Taber MacCallum, the company’s chief technology officer. The capsule will feature Wi-Fi along with a bar and a lavatory for its six passengers and a crew of two. To read more of the story at the LA Times, click here.